64 ¾ x 115 ⅞ in. Thomas Moran aspired to become one of America’s first history painters. Known for creating large-scale canvases infused with noble stories, history painters were traditionally respected in European artistic circles as the more important of their peers. Moran wanted to paint scenes that depicted momentous events in America’s relatively short past, and hoped this painting of the Spanish conquistador Juan Ponce de León (c. 1474 – 1521) in the company of native Floridians would hang in the House of Representatives in Washington, D.C. Instead, magnate Henry Flagler (1830 – 1913) purchased the work for one of his new hotels in St. Augustine, the Ponce de León. 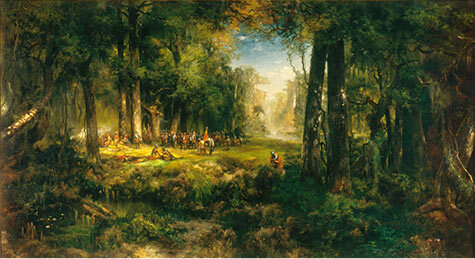 Despite the fact that Moran depicted Plains Indians rather than the Timucua who would have inhabited Florida at the time, he represented Florida’s lush landscape accurately.